Celebrating UD’s efforts to support aquaculture in Delaware’s Inland Bays are David Small, DNREC secretary; Sen. Tom Carper; Sunny Jardine, UD’s College of Earth, Ocean, and Environment; Ed Lewandowski, Delaware Sea Grant; Chris Bason, Center for the Inland Bays; and Kathy Beisner, U.S. Department of Agriculture. U.S. Sen. Tom Carper (D-Del.) joined local and state officials, representatives from the University of Delaware and the Center for the Inland Bays to announce two federal grants to support the development of oyster farming in Delaware’s Inland Bays. “These grants from the U.S. Department of Commerce and USDA Rural Development will look into the business potential for Delaware shellfish aquaculture,” said Carper. “Oyster farming is a win-win for Delaware, since oysters improve water quality and farming will create another local industry that provides jobs. There is good work being done in Delaware by both public and private partners, and these grants will help further that research.” The U.S. Department of Commerce awarded $164,341 to the University of Delaware to study the economics of ecosystem services from aquaculture and estimating consumer willingness to pay for oysters marketed as local and marketed as improving water quality. “We are all extremely excited to see oyster aquaculture come to our state, because oysters have the potential to be both good for the economy and good for the environment and it is somewhat rare that you see these two things go hand in hand,” said Sunny Jardine, assistant professor of marine science and policy in UD’s College of Earth, Ocean, and Environment (CEOE). “Having oysters in the water improves water quality, because oysters filter nutrient pollutants out of the water, such as nitrogen and phosphorous, which come from agricultural and urban runoff and pollute our water bodies.” At UD Jardine is coordinating with other scientists and economists including: George Parsons, an environmental economist in CEOE; Joanna York, a marine ecologist in CEOE; John Ewart, Delaware Sea Grant aquaculture specialist; and Kent Messer and Maik Kecinski, experimental economists in the College of Agriculture and Natural Resources. Also, USDA Rural Development awarded the University’s Sustainable Coastal Communities Initiative a $28,287 Rural Business Enterprise Grant to work with the firm ab+c Creative Intelligence to research and develop a branding strategy for Inland Bay aquaculture products that will be used by all the new shellfish farmers to brand and market their products to restaurants and customers. “With funding support from USDA Rural Development, we have initiated an effort to develop a strong, local market share for Inland Bays aquaculture products,” said Ed Lewandowski, Delaware Sea Grant’s coastal communities development specialist. “Creating brand affinity with consumers and brand equity for producers will be absolutely critical to gaining successful product entry and then sustaining this market success.” Setting the stage for shellfish More than 10 years of applied research, demonstration and technology transfer work guided by Delaware Sea Grant (DESG) in cooperation with the Delaware Center for the Inland Bays (CIB), and Delaware State University has documented the value and benefit of shellfish aquaculture as a means to improve the quality of the Inland Bays estuary and to enhance local seafood production and economic development. 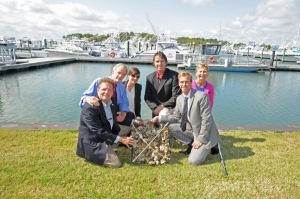 During 2013, DESG participated in a shellfish aquaculture stakeholder work group organized by the CIB to conduct spatial planning for bottom lease siting, and to draft statutory code and regulatory language to reinstate a bottom leasing system for commercial shellfish aquaculture for the Inland Bays. Other participants included the Delaware Department of Natural Resources and Environmental Control, Delaware Department of Agriculture, Sussex County Economic Development, Local on the Menu/Farm to Table Program, recreational fishing interests, commercial clammers, and prospective shellfish aquaculturists. Sea Grant participated in monthly meetings of the spatial planning and policy sub-committees, coordinated a policy paper “Shellfish Aquaculture in Delaware’s Inland Bays: Status, Opportunities and Constraints,” and participated in meetings to brief Delaware state legislators. Completed draft statutory code changes were incorporated into legislation (House Bill 160) that was submitted to the General Assembly in June 2013. HB160 was passed unanimously by the House and the Senate in June and the bill was signed into law by Gov. Jack Markell on Aug. 28, 2013. The aquaculture regulations were published in August 2014. About Delaware Sea Grant The University of Delaware was designated as the nation’s ninth Sea Grant College in 1976 to promote the wise use, conservation and management of marine and coastal resources through high-quality research, education and outreach activities that serve the public and the environment. UD’s College of Earth, Ocean, and Environment administers the program, which conducts research in priority areas ranging from aquaculture to coastal hazards. Article originally published on UDaily, click here.